Civil engineering and infrastructure specialist Barhale has announced it has been awarded the £9 million main civils package at Barn Elms Sports Centre work site in Richmond, part of the Thames Tideway Tunnel (TTT) project. The contract, which started earlier this month and is due for completion in two years, was awarded by the BAM Nuttall, Morgan Sindall and Balfour Beatty joint venture in delivering the west section of the 25km tunnel. It will see the West Putney Storm Relief Combined Sewer Overflow (CSO) intercepted at Barn Elms by constructing a series of complex underground structures connecting it to the main TTT beneath the River Thames. A 35m deep CSO drop shaft formed with a sprayed concrete lining (SCL) primary lining and 6m ID secondary lining, will convey the storm flows from the existing CSO down though a vortex generator and a drop tube to the connection tunnel, which will be constructed by a 2.5m x 215m pipe jack finished with a 2.2m ID secondary lining. Barhale has 35 years’ experience in the construction industry and was founded by chairman Dennis Curran in 1980. Barhale is currently operating on all the three sections of the project and also the Thames Tunnel system modification works at Beckton sewage treatment works in east London that will support the overall TTT project. In March, Barhale was awarded a five-year contract worth about £26 million for Lot 1 on the proposed high speed two (HS2) rail project as part of the Affinity Water framework for network modifications. The water company awarded contracts worth an estimated combined £55 million for the framework. The TTT aims to manage the amount of sewage discharged in the River Thames and the growth in water and sewerage demand associated with London’s growing population. It was also designed to ensure the resilience of the infrastructure to changing weather patterns associated with climate change, in particular warmer and wetter winters that are likely to result in more frequent combines sewer overflows. The construction of the 16-mile long TTT is part of the broader London Tideway Improvements plan which will include the construction of the Lee Tunnel to connect the TTT to the Beckton wastewater treatment works, and the upgrade of five sewage treatment works: Mogden, Crossness, Beckton, Riverside and Long Reach. Earlier this month new images were released offering a vision of how the river will look in the future. 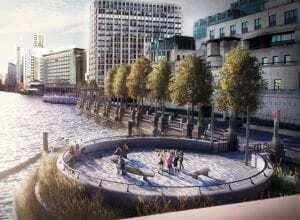 The images depict seven new public spaces that are to be built as part of works to build the tunnel, more commonly referred to as London’s “super sewer”.